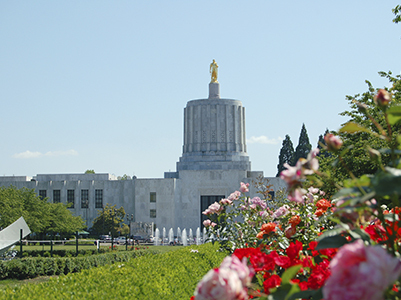 The biggest news from the 2017 Oregon Legislative Session was the failure of attempts to end a statewide ban on rent control and to end no-cause evictions. The work done by the rental housing associations, More Housing Now, the Equitable Housing PAC and the Multifamily Defense Fund were the linchpin in keeping a lid on those efforts. Unfortunately, Oregon House Speaker Tina Kotek promises to resurrect these issues in 2018. Donate at www.hfore.com/donate. Extends the affordable housing lenders tax credit and increases the cap. The Housing and Community Services Department may certify qualified loans if the total credits attributable to all eligible qualified loans do not exceed $25 million (previously $17 million) for any fiscal year. Establishes the Affordable Housing Land Acquisition Revolving Loan Program with $3 million and directs 40% of the loans to go to organizations operating home ownership programs for low-income households. Modifies the definition of low-income households for those renting and owning residential housing in the Local Innovation and Fast Track Housing (LIFT) program. The LIFT program awards subsidies to developers building affordable housing for low-income households in Oregon with a focus on rural communities and communities of color. LIFT applicants are eligible for a maximum $38,000 subsidy per affordable housing unit offered to residents earning at or below 60% of the area median income. Habitat for Humanity frequently uses programs like LIFT to help low-income families achieve home ownership. Requires local jurisdictions to review and make decisions on permit applications for qualifying affordable housing inside of the Urban Growth Boundary (UGB) within 100 days. Requires cities and counties to approve application if clear and objective development standards for “needed housing” are met. Expands definition of “needed housing” to include affordable housing and housing on land zoned for residential use. Cities and counties must allow at least one accessory dwelling unit (ADU) for each detached single-family home in areas zoned for single-family. $25 million in lottery bonds for the preservation of affordable housing – a $20 million increase in bonding from the 2015-2017 authorization. $80 million in state-backed bonds for affordable housing development via the Local Innovation Fast Track Housing Program (LIFT). Authorizes city or county to adopt ordinances or resolutions providing property tax exemptions to commercial, industrial and multifamily buildings built before January 1, 1993, that will be seismically retrofitted, for period not to exceed 15 years. Provides that person may not dispose of, or transfer to another person for disposal, material or media that display Social Security number unless person, before disposing of material or media, makes Social Security number unreadable or unrecoverable or ensures that person that ultimately disposes of media or material makes Social Security number unreadable or unrecoverable. Requires seller of real property to disclose seismic risk in seller’s property disclosure statement. Authorizes residential tenants to install and use electric vehicle charging stations on premises for personal, noncommercial use. Declares charging station to be personal property of tenant unless otherwise negotiated between parties. The measure establishes that the tenant is financially responsible for the costs associated with permits, installation and maintenance of the charging station, and the cost of electricity associated with the charging station. Charging stations must be installed and removed by a licensed, journey-level electrician. Tenant must maintain liability insurance policy in an amount not less than $100,000 that includes coverage of the charging station. Require a tenant to submit an application before installing a charging station. Require the charging station to meet the architectural standards of the premises. Impose reasonable charges to recover costs of the review and permitting of a charging station. Impose reasonable restrictions on the installation and use of the charging station, provided the restrictions do not: (a) significantly increase the cost of the charging station; or (b) significantly decrease the efficiency or performance of the charging station. Limits landlord assistance under program to damages awarded in judgment following hearing in which landlord proves amount of damages. Repeals requirement for tenant to repay Housing Choice Landlord Guarantee Program for assistance paid to landlord. Provisions apply to claims for financial assistance based on judgments entered on or after operative date.